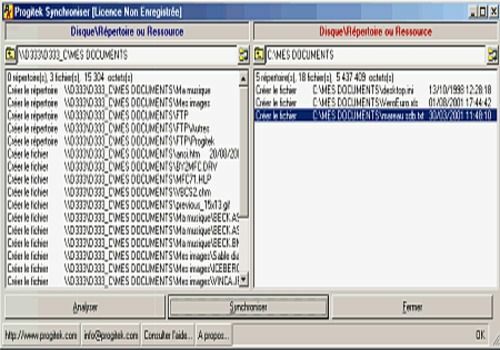 Synchronize data from two different resources: networks, workstations, PCs or laptops regardless of the medium: disk, floppy disk, Zip, CD-ROM, subdirectory or shared directory The software creates the necessary directory tree on one and/or the other resource, copies the most recent files from one to the other, and vice versa. Google Drive allows you to store files online so you can access them from anywhere, simply with your Google Account. This service is impressive for its simplicity and reliability. AnyTrans for Cloud is a powerful cloud manager with which you can easily manage, transfer and synchronize your cloud files. PCloud is a cloud service that allows users to store and access their files online. The service offers classic offers with subscription but also lifetime purchases. A better solution for transferring contacts, SMS, photos, music, videos and more to your iPhone and iPad. Manage your data by exporting, adding, deleting, etc. Aiseesoft Transfer iPhone-PC is a convenient synchronization software, you can export video, audio, photo files to PC as you want.